A blog on tests I do using the Blender 3D CGI software, which I will be using to make short movies. Surprise discovery: colors can be keyframed! I just noticed something today on Blender 2.79. When trying to re-create a way to change colors using curves, I noticed you can set keyframes on color changes! If you want to do this, change the color of the object, right click the color in the material tab, and select "Insert keyframe". 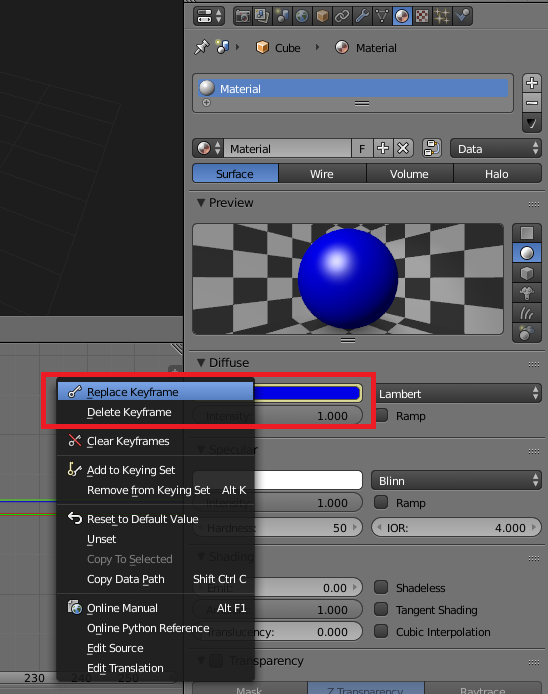 It will change to "Replace keyframe" if you already had a keyframe set (see screenshot). I guess most of you may know this, but I thought I should mention in case there is a person (like me) who did not know about this feature before. It should be useful when trying to make animations of Christmas decorations, changes on colors of objects, etc. For quite some time I have been thinking on updating my computer. Even with the power of the CPU and the (hopefully) big enough amount of memory, rendering even a cube with a plane underneath it took around 10 seconds, more or less using Cycles. Since I noticed I had some extra money (sadly not enough to replace the PSU and the GPU), I decided to buy a video card with a GTX 1050 Ti. I received it yesterday and installed it this morning, and it is waaaaay better than the RX 550. Oh, and the results with 3D Mark look way better, too. I'll resume posting results of experiments with Blender once I restart. I have an experiment regarding particles, and I will be sharing my results once I understand how the particle system works in both Cycles and Eevee. One of the scenes I want to make will be, hopefully, something similar to several anime, including Ruroni Kenshin: a pan-like effect. 3rd test:moving the camera around the object. Please note that these are tests, so the camera movement may be a little bit faster than it should be. I'll be adjusting the camera movement when working on the main video. Which do you like better? Please let me know. Some people may ask: why are you using Blender to make videos? Well, I have been using Blender for a while; from 1999 to be more precise. At that time, Blender was...let's say, kind of shareware: the basic options were available for free, and you had to pay for a key to access more advanced options, like animation. I discovered it when I was starting to get into 3D CGI, trying it along with Metasequoia, and demo versions of other software. I found out Blender to be the most attractive: it had quite a lot of features, and the executable file could fit in a floppy disk, which was 1.4 MB, 1/100 of its current size. A few years later, NaN, the makers of Blender, made the software completely free. There was no need for a key to make animations, which had me starting to try creating animations. I made animations every once in a while, and showed it to family and friends. I also showed them in GeoCities, but I lost access to it. I should have some animations at home; I have to look for them. In 2008, when I started working on translations, I put 3D CGI aside for a while, while trying to look for clients, and working as a programmer at the same time. My tenure as a programmer did not last long, and started changing jobs every 1 to 2 years. The periods when changing jobs started turning shorter, and then I fell sick for about half a year. Now that I am (or think I have) recovered from my illness, and found a stable job that allows me extra time for other activities, I started thinking on working on some ideas I had in the past, one of them being what it is mentioned in the title of this blog. And, after seeing how Blender evolved... Wow! I am really surprised.I cannot wait to get my hands on version 2.8 and the Eevee renderer. Actually, yeah, I downloaded the experimental version and testing it,and I like it. I need to learn how to apply materials, though. I think I will be doing that while doing some animation tests. After getting through a lot of ideas I have, I decided to start working on one of them: a short, comical video. For this, I will be using Blender. First of all, I will be running some test animations with simple objects (spheres, cubes, etc. ), and then I will proceed with modelling, rigging, etc.